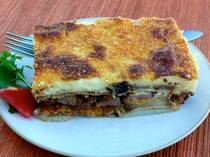 Moussaka (moo-sah-KAH) is perhaps the most widely recognized Greek dish. This recipe is a result of tinkering with the traditional ingredients to make a lighter, vegetarian moussaka recipe. I wouldn’t recommend trying to whip this up on a busy weeknight as it is still quite time consuming. When you have the time to devote to prepping the vegetables and baking the dish, it will make an excellent dinner entree for friends and family. Place the eggplant and zucchini slices in a colander and salt them liberally. Cover with an inverted plate weighted down by a heavy can or jar. Place the colander in the sink so that excess moisture can be drawn out. They will need to sit for at least 15-20 minutes. Peel the potatoes and boil them whole for about 10 minutes. They should not get too soft, just enough to be tender (parboil). Drain, cool, and slice them in 1/4 inch slices. Set aside. Line a baking sheet with aluminum foil and lightly grease. Add a splash of water to the egg whites and beat lightly with a fork or whisk. Spread breadcrumbs on a flat plate. Rinse the eggplant and zucchini slices and blot excess moisture with paper towels. Set the zucchini aside with the potatoes. Dip the eggplant slices in the beaten egg whites and then dredge them in the breadcrumbs, coating both sides. 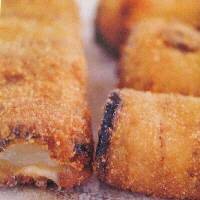 Place breaded eggplant slices on baking sheet and bake for 1/2 an hour, turning them once during cooking. Heat olive oil in a large saute pan. Add onion and saute until translucent, about 5 minutes. Add garlic and cook until fragrant, about 1 minute. Add mashed chickpeas to pan with tomatoes, tomato paste, cinnamon, oregano, cumin, sugar, salt, and pepper. Allow the sauce to simmer uncovered so that excess liquid can be cooked out. Lightly grease a 9 x 13 x 3 inch baking pan. Sprinkle the bottom of the pan with breadcrumbs. Leaving a small space around the edges of the pan, cover the bottom of the pan with a layer of potatoes. Top with a layer of eggplant slices. Add tomato sauce on top of eggplant and sprinkle with grated cheese. Add zucchini slices next. 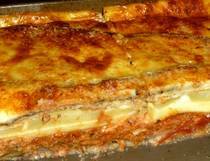 Top with another layer of eggplant slices and sprinkle once again with grated cheese. Simmer over low heat until it thickens a bit but does not boil. Remove from heat, and stir in beaten egg yolks and pinch of nutmeg. Return to heat and stir until sauce thickens, being careful not to scorch it. Pour the béchamel sauce over the eggplant and be sure to allow sauce to fill the sides and corners of the pan. Smooth the béchamel on top with a knife and sprinkle with remaining grated cheese. Bake in 350 degree oven for 45 minutes or until béchamel sauce is a nice golden brown color. Allow to cool for 15 – 20 minutes before slicing and serving. You can make this dish ahead up until the making of the béchamel sauce and refrigerate. Make the béchamel sauce right before you intend to bake it.